During the holidays I began working on refreshing our condo rental bathroom, to take it from dated & dull to feeling tranquil, spa-like, and Hygge inspired. When we moved in, we were just immediately happy we had double sinks -- we didn't care too much what the bathroom was doing beyond that point, to be honest. But I quickly realized the bathroom wasn't serving us in the way that we needed, much less wanted. And to be clear this isn't to say something was "wrong" with the bathroom. Instead, it was about us really taking the time assess our needs and then finding ways to implement them. 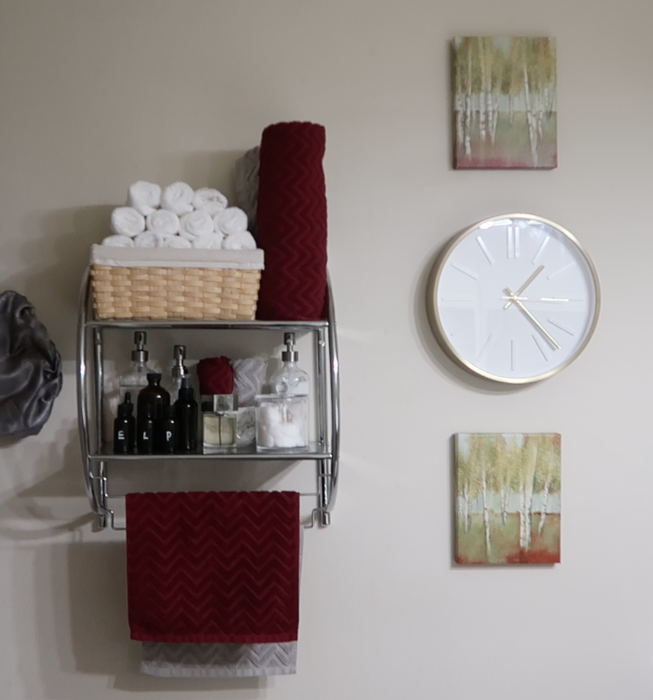 Add to that the fact that I wanted to create a more spa-like, tranquil bathroom environment, one where I brought in the Hygge from the rest of the condo -- I knew I had to look into some upgrades & ways to refresh the bathroom. This was in no way intended to parallel a major renovation; instead it was finding efficient and creative ways to simply uplevel the space. While still a work in progress, check out my progress so far with stylish storage solutions, budget-friendly DIYs, and creative design. Lastly, overall, I just wanted the bathroom to feel more tranquil & spa-like, a great place for us to start and end the longs days. After settling in, the very first thing we did was add some storage solutions -- a 2 tier wall shelf with towel bars and behind the door hooks. We also made a few changes to the shower but swapping the standard shower head for a large 6" rain shower head, and installing a curved shower rod. The latter was especially important for us in this slim space because a curved shower rod expands the shower space, keeps water from leaking out, and added a more chic look to the area. We did all of these within the first week and then nothing else, so naturally, it wasn't long before the bathroom truly become a dysfunctional, cluttered, un-zen mess! The storage shelves, while "functional" didn't help in the appearance of things -- it consistently looked cluttered & messy, despite technically being organized. Because of all the different types of products, there also ended up being a lot of overflow to the counters. 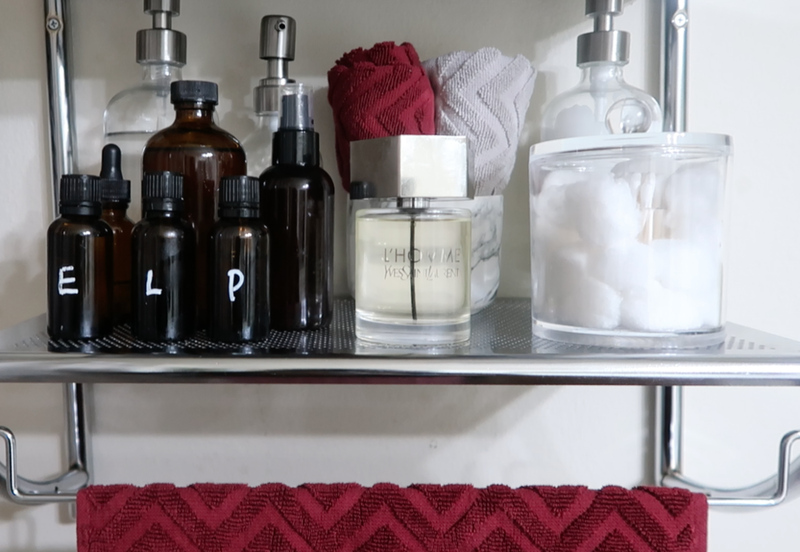 I knew we needed stylish storage solutions and because I wanted a very curated, high end look, I settled on swapping the hodge podge of product bottles for glass jar pump bottles. Months prior, I'd purchased a set of these bottles for the hand & dish soap in the kitchen, and absolutely LOVED em. I knew these would be PERFECT for the look & vibe I wanted to create in the bathroom! 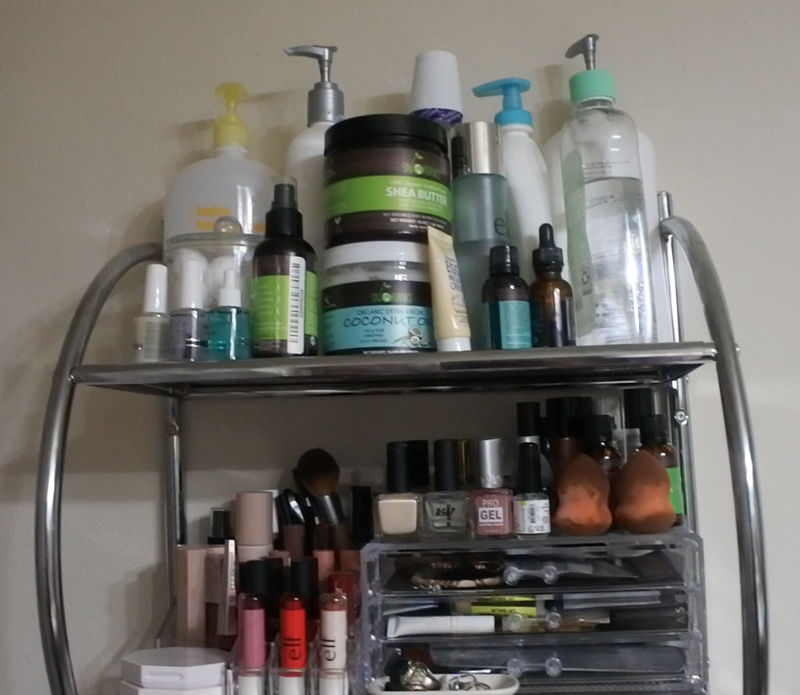 I purchased a combination of 16 oz bottles, 8 oz bottles, and 12 oz jars ensuring that all the product that used to look a hot mess in the bathroom could not be displayed in a way that was aesthetically pleasing but also pragmatic -- it's really easy to know when you need to replace a product when it's bottle is transparent! The amber glass drop bottles were actually the original bottles for the oils. Rather than replace em, because there was no need to, I simply removed the labels! The glass amber bottles fit the look & were a perfect pop of contrast to all the transparent glass. The final touch was labeling the bottles (more for my husband than for me) with chalk marker. Other acrylic accessories like the toothbrush holder, tumbler, and cotton swap/ball holder were the perfect additional touches to this minimal, chic, curated look I was going for. Now while storage was a key component in this refresh, the BIGGEST "elephant in the room" was the brown laminate countertop! To be clear that was nothing wrong with the actual counter, but it dated the space and overall, was just not our preferred aesthetic. While not a deal break for moving in, it was certainly something I wanted to resurface if possible. The solution was an affordable DIY -- marble contact paper! I knew the look of marble would instantly give the entire space a facelift -- a lighter, brighter surface for a more modern look. Was it easy? No. Not even close, to b honest, lol. But it was totally worth the effort. The great thing about contact paper is that it's removable, so if necessary, I could update& refresh it PLUS it's a vinyl film that cleans easily and is water resistant. Next, I worked on the under cabinet storage. While not seen, it definitely gave me anxiety every time I needed to access the cabinets and/or drawers -- they weren't organized in any real way, so I needed to come up with a way to use em better. Getting creative with baskets and canisters was perfect for what I needed. While I still have some organizing (please read: decluttering) to do, I'm much happier with how it's functioning compared to before. The last bit of the refresh came through in the accessorizing and styling. I really wanted to introduce elements of Hygge in the space. Paring down & investing in new textured towels & crisp, white washcloths really elevated the look of the wall shelves & hooks. A brand new gold trimmed clock added a touch of glam while some woodsy inspired artwork added visual interest & pops of color, really bringing the walls (and space) to life. Opting to use a non bathroom runner was another way that I was able to create a more modern look and add a bit of comfy (yet practical) character. And the last bit of Hygge: candles! A beautifully cased candle paired with some flameless LED candles is perfect way to really setting a spa-like, cozy mood in an effortless way. The wallpaper is probably the biggest unknown because (1) I can't decide on a style (I've narrowed it down to 3 choices) and (2) I don't know how much I want to actually wallpaper anything, lol. Since I've narrowed it down, I'd LOVE is you help me pick the wallpaper and vote on one of the 3 choices. Chances are I'll be recording the whole transformation (assuming it doesn't kill me) to share with you so I figured why not bring you in on the action! What I love about all 3 options is that they're from WallPops! and I absolutely love their products, so I know I can't go wrong either way. While wallpapering may be a more meticulous transformation compared to painting, its not one that is super permanent (these are all peel & stick, so another great reversible upgrade!) and it allows to more versatility. I don't want to over do anything, so while deliberating on those remaining 3 updates, I want to live with the space a bit more, declutter the cabinets, and take my time really assessing what's working, what's not, and what needs to be next. But even just these few small steps have made me a much happier renter.